Twenty workers at the The Hanford Site nuclear facility in Washington state were sent for medical evaluations after inhaling chemical vapors in the vicinity of a leaking nuclear waste tank which was being transferred, according to US Energy Department officials. Hanford tank workers were performing routine tasks at the vast nuclear waste site when they all started complaining of headaches on Thursday before being sent for medical evaluations, according to local news station KING. Starting around noon, two of the workers reported a metallic taste in their mouths after removing their oxygen respirators. They said they had headaches and sought medical attention. The AP tank farm where they were working was evacuated. Two hours later, two more workers said they had nausea and a dry throat after being exposed to vapors above a line used to transfer water between the AX and AP tank farms. The area they were working in was also evacuated and roadblocks set up as precaution. In a third instance, between 3:00pm and 4:00pm, seven more employees near a changing trailer outside the AX farm requested medical attention after smelling ammonia. The pumping and waste transfer was eventually halted. More workers requested medical evaluations on Friday because of potential exposure to chemical vapors, according to Tri-City-Herald, bringing the total to 20 people. Thirteen reported having various symptoms, most of which were not made public, and seven sought medical evaluations as a precaution, according to Washington River Protection Solutions. All but one has been cleared to return to work; that worker is still being evaluated. “Waste transfer operations from double-shell tank AY-102 to double-shell tank AP 102 have been halted,” said Jerry Holloway, an executive at WRPS, a government contractor, in a statement to KING. The exposure comes just a week after it was reported that thousands of gallons of radioactive waste were leaking from the AY-102 double-shell tank. The leak was first detected on April 17, which led to workers pumping out the waste and trying to find out why the leak became worse. 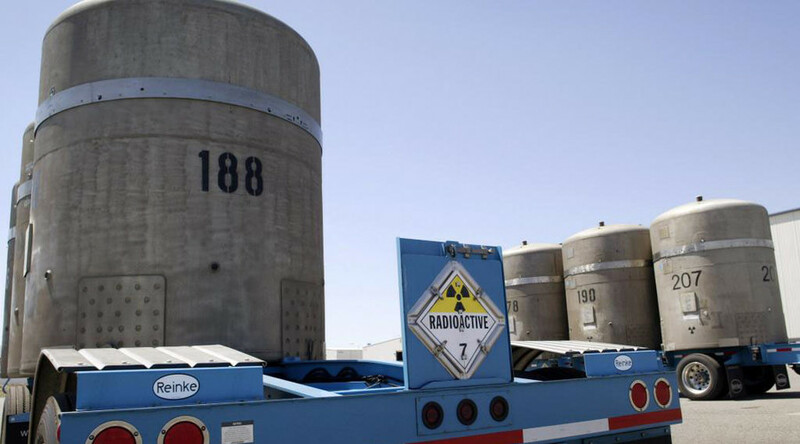 The tank, which contains 800,000 gallons of nuclear waste has been leaking since 2011. The leak was small when it was first detected, but that was five years ago. AY-102 is one of 28 underground double shell tanks holding nuclear waste and is the first of the double-shell tanks to leak. The double-shell tanks are thought to be more robust than the single-shell which have outlived their lifespan. There are 177 underground tanks in total. KING reported the toxic gases most likely escaped from pipes used to move nuclear waste from one area of Hanford to another. A lawsuit filed by the state’s attorney general in 2015, citing the plant has a health hazard, stated chemical vapors vented from the tanks when the radioactive waste underwent continuous chemical reactions. The chemical vapors can include hydrogen, ammonia, mercury or benzene among other poisons and can cause adverse health effects such as “asthma, chronic obstructive pulmonary disease, central nervous system suppression…and cancers of the liver, lung, blood and other organ systems,” according to the suit. A KING local news investigation found that workers in 50 separate incidents were exposed to vapors leaking from the nuclear waste tanks between January 2014 and April 2015. In one of the incidents, a worker was treated for chemical pneumonitis, an inflammation of the lungs caused by chemical exposure. Hanford Nuclear Reservation was originally constructed in 1942 as part of the Manhattan Project to produce plutonium for weapons, including the atomic bomb, Fat Boy, that was dropped on Nagasaki, Japan. Millions of gallons of nuclear waste was generated by the time production stopped at the end of the Cold War. Since 1989, the only work at the Hanford Site has been related to cleaning up the waste left behind. The site stores approximately 53 million gallons of high-level radioactive hazardous waste in tanks, the size of over 2,600 rail cars. The waste is housed in 149 single-shell tanks and 28 double-shell tanks. All 149 tanks are unfit for use, according to the Energy Department, and the contents are supposed to be transferred to double-shelled tanks. The Associated Press reported the cleanup at Hanford is not likely to be completed until 2060 and will take $107.7 billion to complete.